Diepenbrock’s Muziek bij Goethe’s Faust (Music for Goethe’s Faust) was premiered in the Amsterdam Palace of Industry on 2 April 1918. It was his fourth composition for theatre and the third time Diepenbrock had been commissioned by director Willem Royaards (1867-1929) and his theatre company, N.V. Het Tooneel. As Diepenbrock only received Royaards’ request for collaboration at the end of February, he did not have much time. He composed the eleven-part work in a month, completing it on 26 March, just in time for the first rehearsals. Like with Diepenbrock’s other works for theatre, the accompaniment was to be for an orchestra of no more than thirty musicians. With his staging of Faust (part I), Willem Royaards achieved a long cherished ambition. After signing a contract for a production of the Dutch translation by C.S. Adama van Scheltema (1877-1924) already in 1911, he announced each year that performances were to take place soon. However, there were two reasons why Royaards postponed his plans every time: on the one hand, financial problems at the beginning of the First World War formed a serious threat to the existence of the N.V. Het Tooneel. On the other, Royaards was afraid that the majority of the Dutch press would be negative about his mise en scène. In 1904 he had presented Faust in the German language in a three-hour solo performance and this daring enterprise had been received sceptically. Since years, Charles Gounod’s opera version of Faust was far better known in the Netherlands than the rarely staged original by Goethe. Diepenbrock’s incidental music to Faust is for spoken and sung voices (solo and as a choir) and orchestra. The composer interpreted Goethe’s drama as a modern equivalent of the Greek tragedy. This explains his choice for melodrama, which plays an important role in this score: in the Opdracht en Proloog in den Hemel (Dedication and Prologue in Heaven, I and II) the text of – successively – the orator, the three archangels and the Lord is provided with orchestral accompaniment. 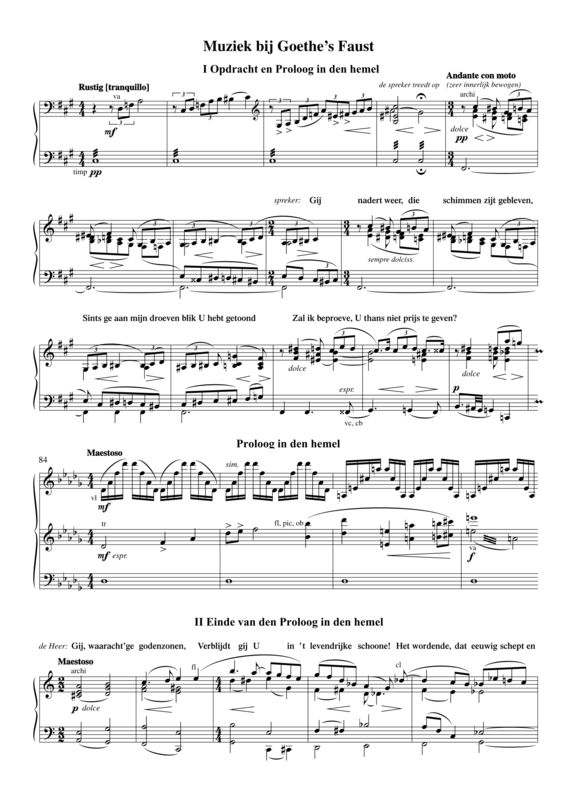 This accompaniment supports the story and it varies from delicate lines in the strings and short clarinet and horn solos in the Andante con moto of the Opdracht, to a monumental Maestoso with ascending motives in the trumpets in the Proloog in den Hemel. A feast follows with sung choruses and songs: in the Paaschliederen (Easter Songs, III) choirs of angels, women and disciples appear. The Paaschmorgen voor de stadspoort (Easter Morning by the City Gate, IV) opens with an instrumental Allegro vivo with a lively melody in the oboe and a simple accompaniment in fifths, followed by the performance of a beggar with a guitar (the sound of this instrument is suggested by pizzicatos in the strings) and a soldiers’ chorus. This movement concludes with the dancing and singing of Boeren onder de linde (Peasants under the Linden). For the drinking party in Auerbach’s Keller (Auerbach’s Cellar, VI) Diepenbrock wrote a simple melody for the song by the daredevil character Frosch. The narrative Brander’s lied van de rat (Brander’s Song of the Rat) and Mephistopheles’ song of the flee have an archaic character. The Ballade van den Koning in Thoele (Ballad of the King in Thule, VII) is introduced by Margareta with a short melodrama. 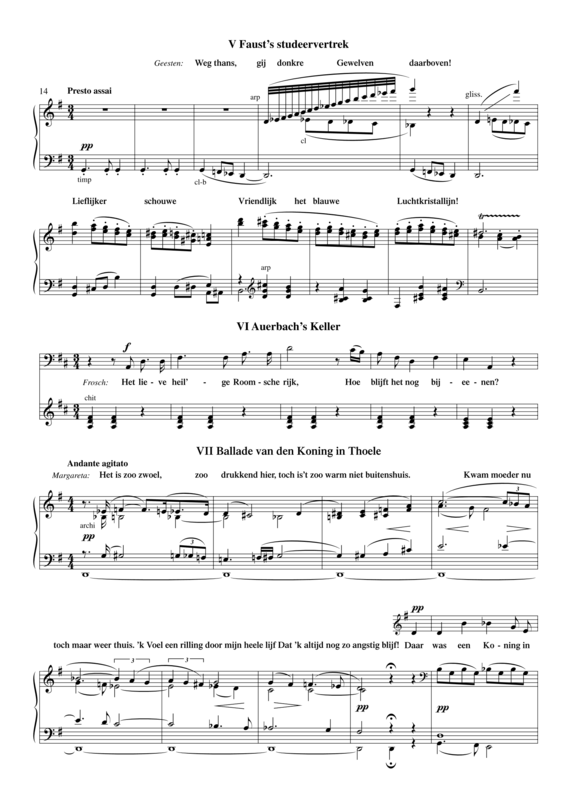 Diepenbrock reused the melody of the song Der König in Thule (The King in Thule, RC 16), which he had composed in 1886. As it would be performed by the actress Jacqueline Royaards-Sandberg (1876-1976) who was not a trained singer, he simplified the melody considerably. In Dom (Cathedral, IX) the dialogue of the Evil Spirit and Margareta is dramatically interrupted when the choir starts to sing the first verses of the Gregorian Dies irae. It is this combination that struck the critics at the time. In the Finale (XI) Margareta’s deliverance from Mephistopheles is depicted by a suddenly appearing soprano solo, which with its a2 soars high above the melodrama. The press discussed the performances at great length. Apart from words of praise for the composition itself from several critics, Matthijs Vermeulen voiced that he had missed Diepenbrock’s individual, unusual, romantic and inventive spirit almost throughout the work, with the exception of the Prologue and the scene in the Cathedral. (BD IX:589) There was also criticism on the long duration of the performance due to the addition of the music. 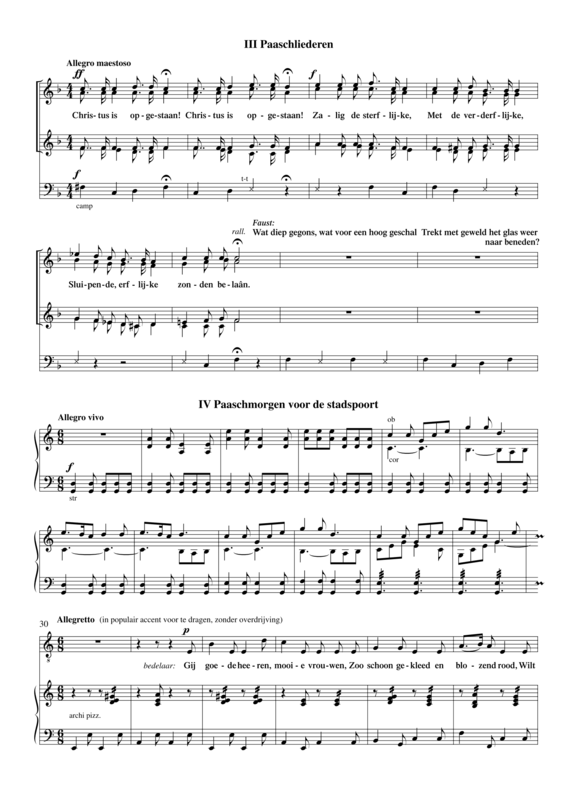 This stood in stark contrast with the Paaschliederen for four-part female choir, sung by the professional ensemble, which received unanimous praise. Diepenbrock had the habit of notating the texts of the melodrama without any rhythmical indications. By doing so he gave the actors, who had received no musical training, no clues about the coordination between the text and the music. The resulting performance issues may have prevented Diepenbrock’s music for theatre from being played more often. 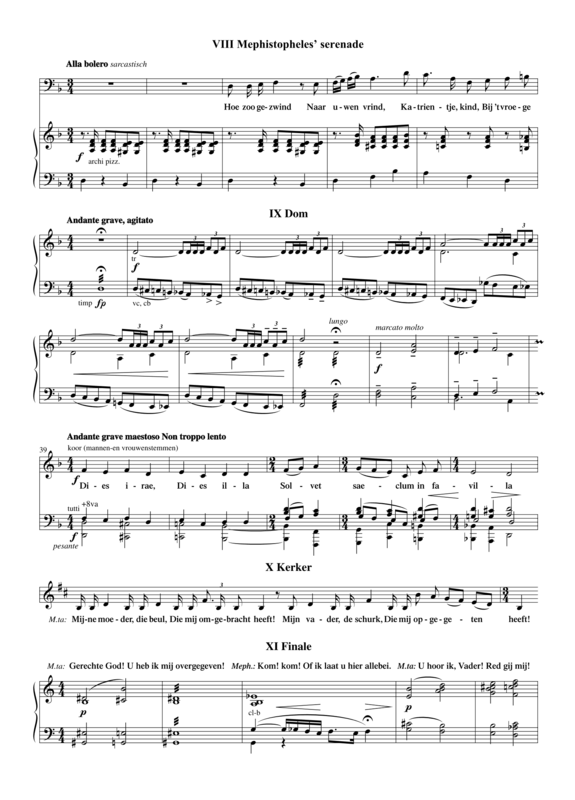 In order to meet this problem and to offer future performers suggestions for the declamation, an edition of the Muziek bij Goethe’s Faust was published in 2005, in which the spoken voice has been provided with a rhythmical notation.